A PowerPoint presentation with think-cell charts. Programmatic logic to control the automation. 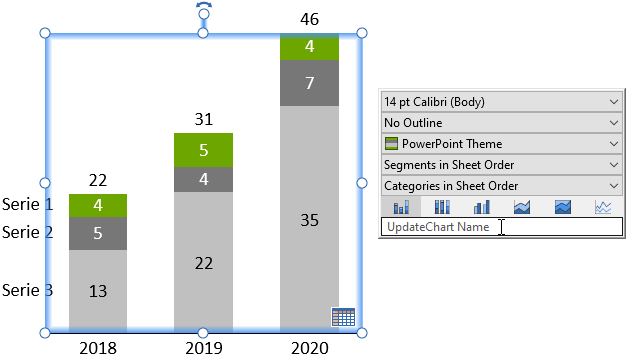 Create a chart in PowerPoint as described in Introduction to charting and later chapters. Any think-cell chart type will work, including all decorations like axes and difference arrows. The initial data is not important as it will later be replaced programmatically by the real data. In the contextual toolbar of the chart, click on the field that says UpdateChart Name. Save the presentation, e.g., as template.pptx. The next step is to create programmatic logic which will merge your Excel or JSON data with the chart. For Excel data, refer to Automation with Excel data. For JSON data, refer to Automation with JSON data. With the process above you can create presentations with arbitrary combinations of think-cell charts. You can prepare a library of all the chart types you need and, as required, versions with different chart decorations enabled. Then, you can freely combine these templates and supply them with data for use in a new presentation using either Excel or JSON. Note: This approach replaces the need for a general API to create charts and add chart decorations, which is not supported.